August sun in Minnesota shines brightly on this beautiful summer day. The white fence and the horses really add to the scene. The barn is in excellent condition and the horses show it’s an active farm as opposed to one that is a leftover from a somewhat forgotten time. 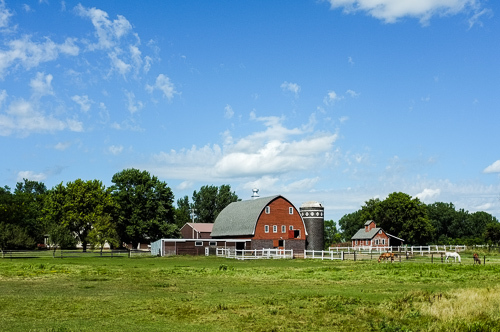 This entry was posted in Uncategorized and tagged barn, blue sky, brick silo, buildings, copyright ryan ware, horses, out buildings, pasture. Bookmark the permalink.